Eka Pada Galavasana, flying pigeon is a big pose, combining hip opening with an arm balance. The elements of balance, strength and openness are essential. This beautiful asana is named for the sage Galava. According to one story, Galava was the son of Vishvamitra, Guru of Rama. ‘Gala’ also means cord. As an athlete, my legs, hips and lumbar spine had become tight, muscle-bound. I came to yoga with some upper body muscle, but not real strength - I lifted weights in order to use my arms as “second legs” in running. Eka Pada Galavasana, flying pigeon pose works to open the deep lateral rotators of the hips: obturators, piriformis, gemellus and quadratus femoris. The particular arm strength we use in Yoga will come; one can work incrementally while building it - not taking it all the way to the full balance, but accepting more weight as you are ready. The external rotation of the hip with some of the body’s weight on it creates openness. Stand with your feet hips’ width apart. Bend at knees until you can place hands on floor, shoulder width apart, six or so inches in front of you, fingers turned forward. Cross left foot over right arm, hooking toes around the upper arm. Inhale deeply, and with a slow exhale, bend right leg at hip and knee, shifting the body’s weight onto hands, and lifting the right foot up and back. Keep toes hooked around arm. Press down through center of the palms, extending through the center of your right leg to raise it up behind you, lowering chest slightly to parallel to floor. Balancing, breathing, lifting. Gaze down past the cheekbones while turning the outer corners of your mouth turned up toward your ears. 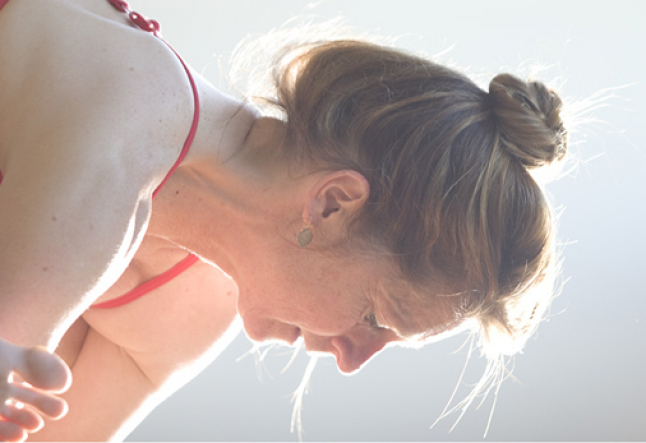 Enjoy the balance, openness and strength in your practice with Eka Pada Galavasana, flying pigeon pose! Eighteen and a half years ago, my running partner tricked me into going to yoga with him. I had been broadsided by a drunk driver, seriously injured, and so was not able to run the first Point Reyes to Bolinas Ridge Trail marathon, much to my dismay. I was missing my endorphin rush, deep breathing, using my body. Friends and family said I would one day understand the meaning of being so seriously injured - that there was a higher purpose in force. I’ll say. Profoundly inspired by my first teacher, Tony Sanchez, I fell in love with Yoga in my first week of classes. I practiced for 385 days without a break, often running the 14 miles round- trip to class. After eight years, I took the advice of my teachers, enrolled in a Teacher Training Program, and began teaching. My yoga practice has been a long, slow, unwinding. Muscles, ligaments, spine, ideas, beliefs and emotions, have evolved into a more open, balanced, stronger woman. Teaching these past ten years has transformed me - has helped me to cultivate compassion and humor, to let go more easily, to grow. Watch a video of Eka Pada Galavasana, flying pigeon pose. LOOK WHO IS “DOING IT" WRITING ABOUT YOGA!